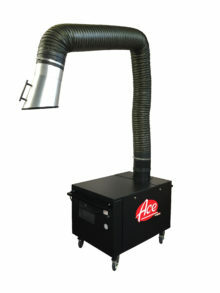 Ace Industrial Products, established in 1967, has designed and manufactured welding fume extractors and related equipment for 45 years from its headquarters in the heartland of the United States – St. Louis, Missouri. Watch this featured video of our products in action here, and view our entire product line, or review frequent questions. Can I avoid using a filtration extractor and instead collect my fumes through a wall mounted arm and blower that exhausts the fumes outdoors? How close should my fume extractor’s hood be to the welding arc? Posted July 10, 2018, 11:25 AM in Industry Resource. Posted June 29, 2018, 11:20 AM in Uncategorized. Posted February 12, 2018, 10:41 AM in Uncategorized. Posted December 15, 2017, 3:00 PM in Company News.